Win prizes from GIGABYTE in Early Spring Quiz! 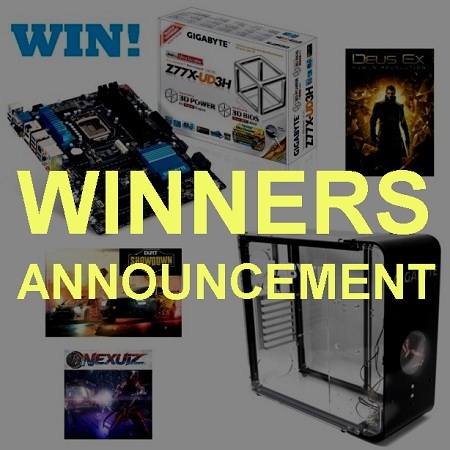 Re: Win prizes from GIGABYTE in Early Spring Quiz! So done with the entries, results gonna be on 25th , waiting eagerly. So... the time has finally come to announce the winners! Congrats to the winners and thanks all for participation! Congratz to all the winners.. was really wishing to win the case.. til next giveaway. I am a Gigabyte fan, but I am shocked I did not know about this website, but thankfully I have now signed up and can see myself browsing around here. I have Gigabyte motherboard and mouse and love them. I sent a private, but I am not sure if it was recieved but I know I sent it and I know for a fact I got it right, as I look on Gigabytes site a lot on tech and hardware. Great kit and hardware. Anyway, thank you for the chance to enter and best of luck to everyone, all the kit is great to win specially the case and motherboard.